"In these litigious times, every doctor should read this book, whether they are currently facing a suit or not!" The purpose of this book is to provide physicians with a reliable and easily readable source of information on preventing a medical malpractice lawsuit. 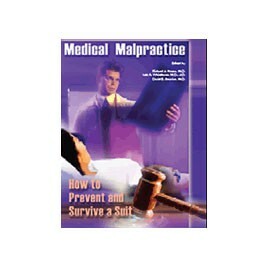 If one occurs, we hope this book provides information useful to the doctor defendant. Time proven techniques for managing your practice and handling difficult patients may help the reader to avoid entanglement in the legal process. An understanding of the rules and procedures of the courts and insurance and attorney-client roles will provide the reader with useful knowledge in the event of a malpractice claim. Litigation stress management techniques including specific self-care recommendations provide a personal, and sometimes vital, cushion of support during this critical time. This book has been written by experienced medical practitioners as well as individuals with degrees in both medicine and law. We have also obtained valuable input from plaintiff and defense attorneys, as well as from individuals with experience in insurance, state medical board regulatory law and advocacy, physician well-being, and financial planning. The authors and editors believe that the information provided in this book will assist physicians in practicing their profession with more enthusiasm and confidence and with less anxiety, fear and frustration. Lee A. Whitehurst, M.D., J.D.